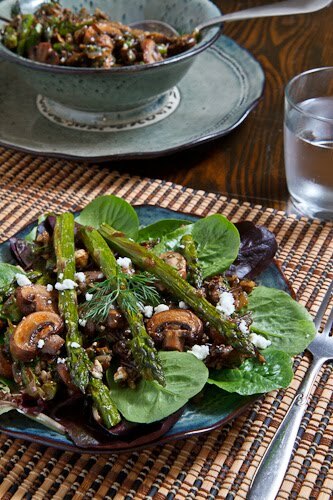 A warm sauteed mushroom, roasted asparagus and wild rice salad in a balsamic vinaigrette with crumbled feta. New things are quickly starting to show up at the farmers market these days which I took as a subtle reminder that I should get my asparagus fix on sooner rather than later! With that in mind I realized that it was time to finish the recipe that had been on my mind for the last few weeks for a warm asparagus and mushroom salad. I wanted to combine two of my favorite foods, asparagus and mushrooms in salad that was served warm over salad greens. I often like to include whole grains in my salads and I was pretty determined to use wild rice but I was unsure as to where to go from there. My uncertainty was solved the other day when I used the dill in the cod wrapped in crispy potatoes with a dill and caper sauce which reminded me of how much I enjoy the mushroom and dill flavour combo and everything else kind of fell into place. I finished the salad off with a balsamic vinaigrette and some crumbled feta, though I had also been contemplating using either goat cheese or blue cheese. For method of cooking I went with my favourites and roasted the asparagus to bring out its full flavour and sauteed the mushrooms until they started to caramelize. In the end, I was quite pleased with the results! The flavours all went wonderfully together and I particularly liked the way the warm asparagus and mushrooms worked with your more ordinary cool salad greens. Bring the wild wild rice and broth to a boil, reduce the heat and simmer covered, until the rice is tender, about 50 minutes. About 30 minutes in, heat the oil in a pan. Add the mushrooms and saute until just caramelized, about 10-15 minutes, and season with salt and pepper to taste. Meanwhile, toss the asparagus in the oil along with some salt and pepper. Spread the asparagus out in a single layer on a baking dish and roast in a preheated 400F/200C oven until tender, about 10-15 minutes. 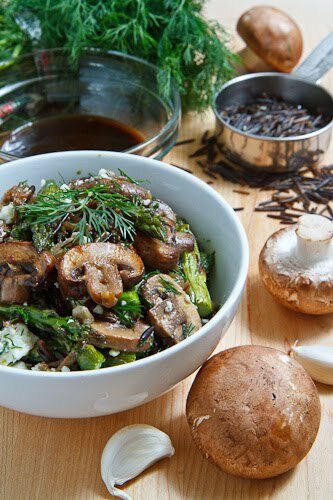 Mix the wild rice, mushrooms, asparagus, dill and balsamic vinaigrette. Serve with the mushrooms and wild rice on a bed of salad greens, topped with roasted asparagus and garnished with crumbled feta. That looks so good kevin. I missed dropping by here as I was on a vacation.. This looks really, really delicious! I love the wild rice and mushroom combination, and asparagus and feta can never be wrong! Nice photos too. I love how you tasted your way to this delicious salad! It seems like each component really compliments the others! Oh man this looks awesome! I'm a sucker for anything with mushrooms and roasting vegetables is my favorite way to cook them. looks amazing, everything you make is so accessible! easy to find ingredients but still unique. love it! I've been loving asparagus. I'm definitely going to try this recipe next week. Glad to find your site. By the way, I'm really impressed with your take on Korean food. this salad looks so fresh and hearty. i'm bogged down with laryngitis at the moment — this looks like the veg-packed pick me up i need right now. beautiful! Asparagus & mushrooms – lovely combo! Kevin, what a gorgeous whole grain salad, perfect for this time of year. I've been thinking of making a warm mushroom grain salad, so I'm so glad I came across your recipe! Beautiful salad, sounds just delish! Kevin, This is the type of thing I would never think of, but when you do it it is just beautiful! This has to be one of the prettiest salads I have ever seen, sounds completely delicious, and also like something I could do. I will definitely be trying this! This looks delicious, I love using fresh mushrooms and asparagus together! I would definitely top mine with blue cheese because I love the flavour combo of a strong cheese and mushrooms. Thanks for sharing Kevin! This is the first year that I roast asparagus and I love it. Nice salad Kevin! I don't see nearly enough recipes with wild rice in them. (The ones from my mom all seem to involve cream of mushroom soup.) Thanks for a really lovely salad! Made this for a party and everyone loved it! The layers of flavor were perfect. Can't wait to venture further in the Closet for more great awakenings. I made this for a late afternoon lunch/early dinner and served it over fresh raw spinach. It was soo yummy! this looks soo good! Would you clarify the last 2 instruction items? Thanks so much! This was absolutely delicious. Even non-vegetarians would love it, I'm sure. Thank you!